Our April Issue is dedicated to 4 fantastic artists that are often known for having rabbits in their art. 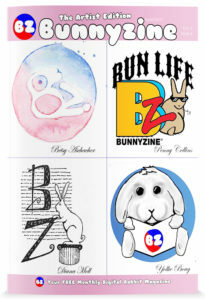 We also have an Art Edition of a new section called Operation Bunny Opinion run by Henry and Bluebelle from My Army Bunny Family. We also have a beautiful tribute to a bunny named Lucky that is an amazing story. We also have part 2 to Ears O’Fluffin’s current case: The case of the missing case. Oh my, have we got an interesting mix this month. 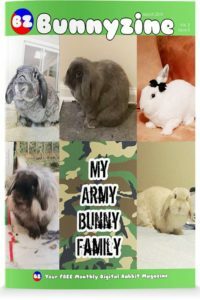 First off, I’m VERY pleased to be featuring My Army Bunny Family because Seana is not only an excellent bunny mom but she is heavily active in the rescue community. I think she’s the absolute best, plus, this has to be one of the funniest features I’ve read in a long time. Bluebelle and Henry really steal the show. You have to read it. There’s also an interesting challenge put forth to BZ readers 🙂 You can read the details inside but essentially, if we can get https://www.facebook.com/crewin402/ up to 300 likes, a very wonderful rescue will be receiving a $500 donation! So pop on over and give them a like and find out the story behind this fundraising idea inside our March issue! Also, we have an advertiser, Bunny Barn, who has a points-reward system for their store and if you grab this issue and find their ad, you can get 50 points FREE (hint: it’s on page 24) so grab your free points while you can. We have a new, and intricate colouring sheet for you to fill in and send to us to publish in an upcoming issue and we have more of Daisy’s antics in Daisy’s Diary. 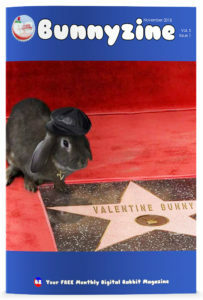 We, of course, have our March Bunny Bites and March Madness Pictorial submitted by you so come check it out. 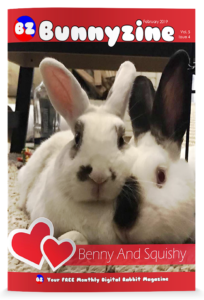 This very sweet couple Benny and Squishy are just so squee-worthy cute! LOOK at those faces!!! They, along with Charilie, Rosie, Ruby, and Fudgie are part of the House Of Bunny Butts. You have to read the backgrounds of Benny and Squishy. It touched me. We’ve also got the Valentine Pictorial from photos you sent in and Valentine Colouring Art. We also have the wrap-up of the latest Ears OFluffin case (The Case of the Evil Blanket). We have this month’s Daisy’s Diary and we also review 5 free rabbit-themed android apps/games. I’m hoping this works, I’m using the post scheduler. Why? 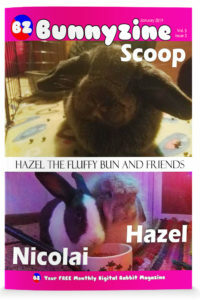 Because I’m out for new years but I didn’t want you to have to wait for our January 1st issue of Bunnyzine where we are featuring: Hazel, Nicolai, and Scoop from Hazel the Fluffy Bun and Friends. These little cuties are just going to melt your heart. -Winter Art by Yollie that you can colour and send into us. -Our Bunny Bites Question: What is your bunny’s new year’s resolution. 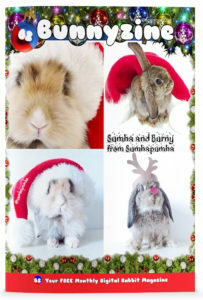 Hoppy Holidays Everybun!! Our Christmas issue is here! SUMBA AND BURNY FROM SUMBAPUMBA!!!!!! You have GOT to check out their pics (not just in our issue but on their fb and instagram) I’m telling you, the squeee is INTENSE!!!!!!!!! Merry Christmas to all and to all a good bun.